The aprons featured in this post are both sheer. The first is one of my favorites, of blue dotted Swiss. I have a thing for dotted Swiss. The red rick rack doesn’t hurt either. And check out the shaped waistband and scalloped hem. I’m taking a guess that this one is from the 1950s. The next one is badly faded, but there are faint remnants of stenciled flowers on the pocket and along the hem. It’s got me stumped as far as age though. Could be as early as the 1940s based on the delicate fabric and fine sewing. What do you think? Since my last apron post, I’ve actually found four more. But I haven’t had a chance to photograph them yet. Besides, I’ve still got plenty to show you from the first batch. These two seem to be a pair. They’re both semi-sheer cotton, beautifully sewn, with contrast binding and embroidered “flower pot” shaped pockets. I’m guessing 1950s on these based on the material’s condition and the overall design, though there’s a possibility they may be from the 1970s. And the pink one has an extra feature – my mother’s name was carefully printed on the waistband with a black pen, as though she wore it in a class, or maybe for a girl-scout project. Underneath her name are two illegible figures that look more like the numbers “71″ than anything else. Maybe the aprons were a gift from my mother to my grandmother in 1971? Or do the numbers refer to her class or scout troop? The suspense is killing me! Mom, if you’re reading this…call me. Here’s another installment from the never-ending supply of aprons. These two are both shades of pink, which may be about all they have in common. The first is pieced, with a center panel of pale pink flanked by sides, mitered hem, and waistband/ties of a matching pale pink flowered print. There’s even a bit of deeper pink rick rack trim along the slanted pockets and around the center panel. Like the gingham aprons last week, this one is hard to date. I know it’s not terribly old simply by feeling the fabric. Would it be a cop out to say it’s from the second half of the 20th century? The second pink apron is decidedly on the older side. I could be persuaded to go as far as the early 1940s based on the item and what I know about my grandmother’s life. It’s a darker pink, and more simply made. All the stitching is machine-done, even the hem, with white thread and teensy tiny stitches. It’s a very close weave cotton and stiff, as though it had been starched many times. The fabric has begun to wear away in spots at the center front, and is a bit faded in some spots and shiny in others. 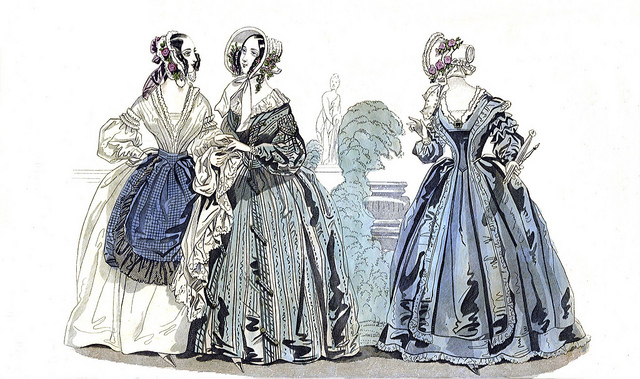 What makes it really splendid though is that the fabric is printed à la disposition. That means it’s printed with a design meant to be incorporated into the garment’s construction, like this decorative faux lace band along the hem for example. Cotton (and perhaps other materials too, though I’ve most often heard of cotton) dresses printed à la disposition were all the rage in the 1850s.